@candidatesfide: “Chess boom: Candidates tournament 2014 with record breaking interest”. “Intruiging to note that the highest visitors to the homepage/webcast of FIDE #Candidates2014 are from Germany even when no player is German.” noted @subhashishnandi. 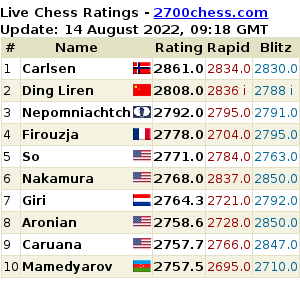 “Today is a rest day at the #candidates2014. For me this means a distraction free workday. Which is nice.” tweeted @tnttoon, Antoon Frehe. No #Candidates2014 today. No excuses to skive :-< tweeted @MarkFPWatts. After round 12 and on the rest day, there were a lots of interesting discussions and tweets about the games and the players. You might have missed a couple of tweets, so I am happy to select a few here. After round 12, Garry Kasparov tweeted about the Candidates. You have to look carefully in his timeline, because he mainly tweets about political issues. But here are a number of interesting, chess-related tweets by the 13th world champion. His account is @Kasparov63. “Losing the championship title can invigorate a player. Anand showing that here. Kramnik did too. Being champ, being the favorite, not easy”. Maybe you remember this tweet by @Chessnor yesterday? “#Anand forced a draw in a winning position! What! Is @vishy64theking a coward or lazy?” Not a very elegant tweet, to say the least. The good thing about Twitter is, that other users can respond: @siddyg: “It’s easy for us to sit aorund with our computers and judge vishy, but he made a very good practical decision.” @lionsofsavuti: “Humans get tired.He ain’t a cmputer.let us accpt tht evryon s diffrnt.he has his freedo to play as he want”. @traderDXB: “Guess it is easy for armchair engine-backed experts like @ChessNor to call Anand a coward.” And @chessnor responded to the tweets: “You are correct! Was getting frustrated that vishy did not win”. @TarjeiJS, the best source of information if you want to know something about chess in Norway, obviously had some twitter debates with Indian chess fans after round 12 and on the rest day: “I’ve never seen so many angry tweets directed at me from Indians, after what I consider a rather uncontroversial tweet about Anand.” Tarjei, what did you tweet then? “I can imagine that an #AnandCarlsen rematch is the 2nd best for the world-wide chess publicity that we could get? Not a bad thing.” Logical question by @kedharf1: “why 2nd? “. And Tarjei answered: “2nd because I think Carlsen-Kramnik would be bigger, taking their rivalry into consideration.” @Nsrivatsa1989: “You talk as if Kramnik-Carlsen is Fischer-Spasky; MC and Norway are recent in chess history and VK is a dead player now”. And he added: “Right now Carlsen-Anand in the biggest rivalry; generational; grave digging during the candidates cannot make MC-VK a bigger one”. One final tweet: “A day without tagging ” #candidates2014 ” is not a day worth living :D” by @Aru_Amit! What is he going to do on Monday?